"Let me show off my weave." Given their superior intelligence, speed, independence and diligence, border collies and Australian shepherds make excellent candidates for training in dog agility. Agility focuses the exuberant energy of these working dogs originally bred to herd. The major agility dog competition associations other than the American Kennel Club welcome mixed-breed dogs. You must first set your agility goals to determine which types of equipment are needed and which behaviors to train. Even border collies and Australian shepherds should begin slowly with less threatening equipment. Most dogs seem to find a shortened tunnel with a treat and trainer waiting at the other end an easy behavior to master. If your ultimate goal is to show in dog agility, ask the show organization which pieces of equipment are required in their beginner classes. 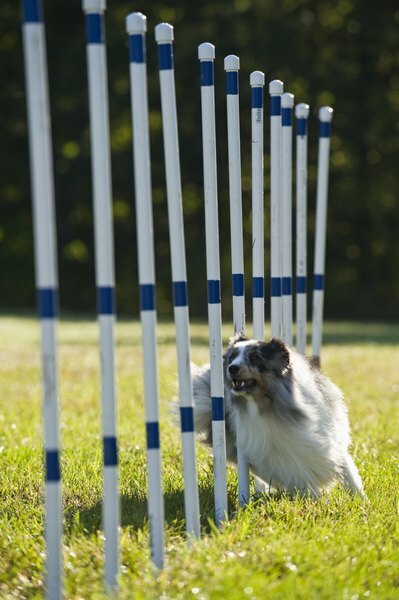 If you have previous experience in agility, training at home can be convenient. If you have not trained an agility dog before or are unfamiliar with working breeds, then a training group may be more productive for you. A good group emphasizes dog and handler safety and sound, humane training practices over ribbons and prizes. Experienced agility instructors provide guidance and a variety of equipment. Trainers who work with excitable dogs such as borders and Aussies, along with those who train for agility, agree that operant conditioning is best. Often called clicker training, this involves rewarding proper behavior that the dog chooses to offer rather than punishing ineffective behaviors. In most agility classes, the dogs run off lead and are not under the direct control of the handler. Training based on the dog's independent decisions will be most successful. Keep your training fun and exciting for the dog to hold his interest and secure his continued cooperation. While you may choose to begin your agility training in the privacy of your home or dog group, head for a more public training location as soon as possible. Most agility shows take place in open, busy environments. Train your dog to focus on you and ignore distractions as soon as he has mastered the basic behaviors. Many agility trainers add a “Watch me” command to get their dog to focus directly on them. At the beginning, work with beginner sized A-frames and lower jumps even for high-energy dogs like the border-Aussie mix to avoid stressing delicate joints. Train in an enclosed area until you are positive your dog will not run off course toward possible danger. Canine Combustion Dog Agility Club: So You Want to Train Your Dog for Agility?